DETAILS: Have a great meal at the Blue Dog Inn and support the Humane Society at the same time. The Blue Dog Inn is celebrating its 30th anniversary and will donate 15 percent of all sales to the Humane Society of Logan County. Information on pet adoption and other Humane Society activities will also be available. All donations will support the construction of a no-kill animal shelter in Logan County. WHERE: Blue Dog Inn, 111 S. Sangamon St. 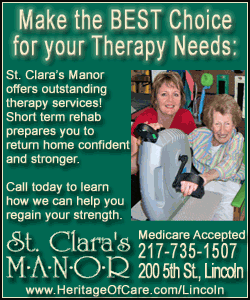 Haunted house: "Trauma on Tremont Street"
DETAILS: For information, call 217-732-3155, ext 280. Family activities and movie: "Frankenstein Meets the Wolf Man"
DETAILS: Fundraiser to assist Lincoln military families in purchasing holiday care packages for loved ones deployed to Iraq and Afghanistan. DETAILS: 25th anniversary Harvest Day. Food, handcrafted items for sale, music, indoor dining, outdoor snacks, entertainment, live auction, something for everyone, with ALL proceeds going to world hunger relief. Handicapped-accessible. No admission fee; free parking. 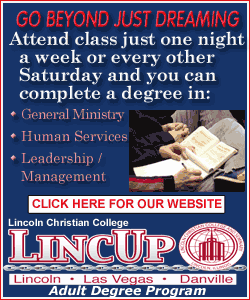 For more information, call 217-732-7618 or e-mail harvest@lincolnil.us. WHERE: Lincoln Christian Church, 204 N. McLean St.
WHERE: Bake sales at Kroger and Wal-Mart. Cookout at Kroger. DETAILS: Third annual event. Ethnic food, inflatable rides, bocce tournament, bags tournaments, family games, silent auction, raffle items, pumpkin carving items, face painting and much more. For more information, contact Carroll Catholic School between 8 am and 3 pm weekdays at 217-732-7518. DETAILS: Schedule an appointment at 735-5050, ext. 327, or www.cicbc.org.